Greetings in the name of our Lord and savior Jesus the Christ. 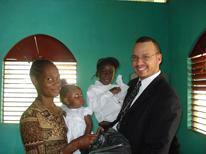 This is my second missionary journey to Jamaica. I want to extend sincere thanks to all of those who have continued to support the evangelic and humanitarian relief efforts of Chosen 300. As with all my blogs, I do not check for spelling or grammar. These are just words from the heart. For those who may be reading this, I ask that you read it with an open mind. These are my observations of the journey as well as my perceptions and the way my heart feels as a write. Some may be accurate and others may be my perception. With this said, my journey starts here. Today was a very long day with a few bumps. My flight departed at 6:45 AM, but before I get to the flight, lets take a few steps back. This mission assignment has a couple goals in mind. 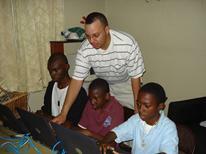 The first goal is to provide a computer lab at the Linstead Baptist Church, so the young people of the community would have a place to do their homework. 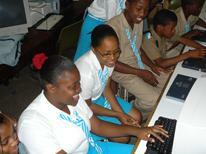 A second lab is being developed for the young people at the McGraph High School. 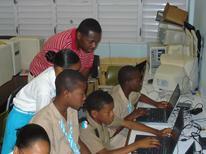 The school currently has about 1300 students sharing less than 15 working computers. I want to thank Jim of "One House At A Time" and Pat Green and her employer (forgot the name off hand), Corrine Gries, & Monica Thompson for donating laptops for this effort. During our time in Linstead, Dexter Scott & I will be sharing the gospel at 2 local schools, as well as conduct a youth service on Friday evening. On Sat & Sunday, we will be assisting in the food distribution, training the staff who will be managing the Chosen 300 food distribution at the "Cacoon Castle Baptist Church", and sharing the gospel there as well at the "Hopewell Baptist Church" in Hanover. Well, let�s start with the events of the day. Last night we stayed at a hotel near the airport since our flight was so early. We called ourselves planning. Well, Dexter left his passport at his house and had to go back for it around 10:00pm last night. I am glad he figured it out in time. Me... I had a worse adventure. We arrived to the airport at 4:45 AM, discovering I did not have my passport, but Shandai�s. Ok, Dexter said it was partially my fault for not checking, but I blame this on Shandai (this is what men do, pass the blame). She had a trip in Nigeria, which she decided to take my passport out of my travel folder (that is owned by me) and leave hers in it. Message to all the wives out there, get your own travel folder. So I called Shandai at 4:45 in the morning, she got the boys up and flew down to the airport so we could make our flight in time. Thank you so much Shandai for getting out of your sleep to save the day. I also want to thank Lisa at US Air. (forgot last name, but she is my Italian Sister) who was a big help in making sure we made our flight. She is a great US Air Employee. We arrived at our connecting flight in Charlotte NC for a 3 hr layover and headed to the Montego Bay Airport. Oh the funny thing... while at the Philadephia Airport, the computers had to be put out in the trays and we had a whole conveyer belt of computers going through the screening. But God gave us favor; the people working for TSA did not give us a problem and helped us gather our things up. Two of the people had come to our Homeless Outreach Center in Philadelphia a few months back to volunteer for the homeless with the TSA volunteer group. On the flight leaving Philadelphia, I bumped into Pastor Shaw of White Rock Baptist Church. We never had the chance to formally introduce ourselves, but he really has a good spirit. Anyway, we had a 3-hour Drive from Montego Bay to the town of Linstead. This was a very long ride. The church just bought a brand new van and we needed the space for our 7 bags of luggage and only 2 small bags of clothes. During, the ride up, we seen a bird sitting on top of a horses back. Pastor Luke said that the horse had ticks and the bird was eating off the horse's back. There is a sermon in this somewhere. We continued on the drive, Luke and I had a great discussion. He started talking about my last blog and some corrections I needed to make, so let me make some now. First of all, KFC does not sell beef patties here, that was my mistake. Ok... that was a small one, but the other mistake he reminded me about was my stating it seemed like the Linstead church was not interested in my help at first. Well there is a lot of history behind it. I don�t want to mess it up, so I am going to restart tomorrow after I re-ask Luke about it. Plus I am dead tired and need some serious sleep. See you tomorrow. I want to start where I left off yesterday. One of the additional corrections to my blog was the Baptist churches did not seem interested in our help at first. Well there is a little bit behind it. First of all, the Baptist work in Jamaica was not established and developed by Americans, but it was developed within Jamaica. 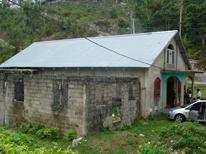 Now, although I am sure that someone introduced the Baptist work here, Jamaicans established it. Secondly, there has been a history of US Pastors coming to Jamaica as if they need to show Jamaicans how to do ministry instead of coming along side with them. Another reason is, Pastors/Missionaries come to Jamaica and often make promises that they either don�t keep or wind up using the money for alternative purposes. I'll tell you something amazing; last week I sent an email out to my supporters and some Pastors who I have relationships with about the computer projects and also the food program. While I was riding in the van with the Pastor from the Airport, he got a call about the email to verify that I was actually doing the work from a member of the Baptist work here in Jamaica. That blew my mind. I am just glad that the Lord helped us keep our promises. I did point out to Luke that one of the Challenges that Pastors in the US have, particularly Baptist, is the Church vote. He mentioned they have something like that as well in Jamaica. They are called �organizers against God.� I did tell him that often Pastors come to foreign lands and are tremendously impacted by the new environment and the poverty. In their emotions, they make commitments that they really believe their churches will support them on. When they return to the US, they are awakened that no one will back them on their goals. I thank God for Chosen 300, our board and our staff that stands with me in ministry, they will here a goal and the question is never if we are going to help, but what can we do and how can we do it. Luke was really glad that we were able to come through. I was pleased as well. Anyway last night was a little challenge. We had a total of 8 laptops and two desktops and they were all working when I left. We arrived at Linstead Baptist church at 5:50PM just before the start of class; we booted up the computers and 3 of the 8 desktops were giving us problems. We were using all of them first to train their entire screen ministry on Easy Worship that we brought them 5 months ago. I am glad we had a chance to re-test them all before we distributed them out. Of the 3 that stopped working I stayed up to 11:00 at night and was able to repair two of them but the 3rd one I could not get running. I talked to the computer tech at the school, and after booting it up he said he knows what the problem was and he could repair it. The class at Linstead Baptist went very well and they were excited, but also seemed a little scarred of the new technology. We are going to give them a live test tonight when we have the Youth Worship Service at Linstead. After the long night of working on the computers, remember I had been up since 4:00 AM, I wrote a little in my blog and attempted to go to sleep. I tried to put some tissue in my ear, but the music from the clubs down the street pierced through the tissue like a sharp knife. I tried to put the pillow over my head, but it was an option of smothering myself to death or hearing the music. I thought the smothering would not be a good idea. I was in and out of sleep all night and then the music stopped around 3:00 AM. Finally there was quite, but then the dog chimed in because it was his turn. Then the rooster kicked in about 4:00AM. I thought they were only supposed to crow once. Seems like this one had a snooze button on him. We got up early to go to our morning assignments. 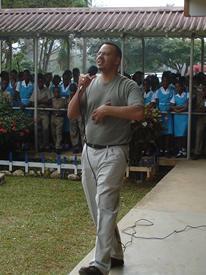 I was at the McGraph High School and Dexter was at one of the elementary schools in Linstead. I was excited. I was like a kid in a candy store. If you remember from my last preaching experience at McGraph, it was the first school I visited and I forgot I could say Jesus there. I did not forget this time. We started the devotions with a presentation of the computers. 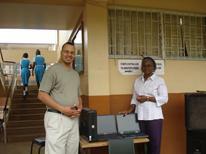 The McGraph school received 1 brand new Dell Desktop and 3 laptops. One of the laptops I mentioned earlier, the tech at the school said he could repair with no problem. The young people were ecstatic that they received the new additions to their lab. 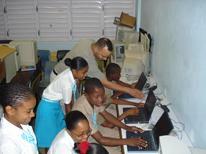 The school has about 1300 students, and they had to share 15 computers. We have increased their lab to 19, and I pray this is not the last trip, I want to bring more to make a difference. I also left one desktop and 3 laptops at the Linstead Baptist Church so the young people of the community can have a place to come to do their homework. The other two laptops, one is going to the pastor of the Cacoon Castle Baptist Church, the last one I gave to the Price & Thompson families who�s home Dexter I stayed at this weekend, the lap tops right and left mouse click was not working, but I showed them how to work around it, at least they can type their papers on it. They have 3 young people now they have taken in, Dane who is 20 and is going University of the West Indies and comes home on the weekends, Jake who is now 17 and disabled is going to Dinthill Technical High School, and Shanell who does not want her age released, is now who is taking evening classes to prepare to go to nursing school. 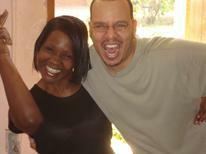 Shanell and Alton are continuing to strengthen their relationship as they strive towards independence. We spent a good deal of time at the school, first getting the computers loaded and getting them on the network so the kids could access the internet. 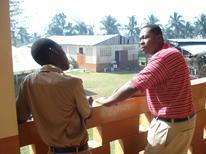 We then went around and shook hands with the children in the classrooms and that were walking along the halls. The principle is on leave right now and the assistant principle is doing her best to keep everything together. I will say that when Principle Anderson was there, she had those kids in check. They seem to be a little more, what�s the word for it, restless. 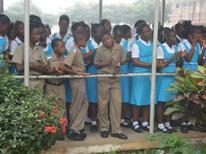 But they still participated in the worship and were respectful. I guess I was comparing it to last time. Dexter mentioned that all the kids he passed called him sir. Our kids in the US could learn a few things from these kids. � Oh just a note Dexter is so worn out, and passed out on the porch from the lack of sleep he had last night. I did see the wild and crazy teacher Mrs. Blackwell that has a personality like me. Last year we had a crazy shot and I just had to have another one with her. We left out from the school about 10:00 and headed over to the church to meet with their office staff to help them network the computers and to sync easy worship with the office computers; as well as connect program the laptop for the Easy Worship projector. It took some time, by the way I have to say I hate the new MS Vista program it has so many problems cooperating with other operating systems and you can not find anything, my advice for those who are buying computers � don�t get Vista, it stinks. One of the members took us back to the house so we can have dinner. We had roast beef, rice and �gongo� peas. They also had some yams, but they are not the yams that you and I know. I think I mentioned these in my last blog. They also had us try this juice called �sorrel wine� that had a serious kick to it (there was no alcohol in it). One of the guys that was riding with the pastor to pick us up at the airport bought a Malta for us (trust me it is not a milkshake). I think they like to have us try stuff to see our facial expressions. I could not get the malta or the juice down so I had to kindly decline, but they were good sports about it. Lunch was great, I let Dexter handle the yams though. I experience those last time. We are getting ready to go to the church for evening worship so I will check in tomorrow and let you know how it went. I have a lot of catch up to do, I admit today I was a little justifiably lazy, better yet worn out from the 2 day marathon, and also the sleep deprivation from the last two nights. The club, the dogs and the rooster was at it again last night, and we had to be up bright and early for the 3-hour drive to Cacoon Castle. Last nights service was great. The office staff had a few hiccups on the easy worship, but I had the chance to help them get through it. They did their best on the screens, and Dexter gave them a hand, but it was their first time so we expected the mistakes. As I sat down on the side bench next to the lectern, I saw a boy running up from the back to sit next to me. It was Charles Michal Williams. If you read last year�s blog this was the little boy who kept running up to me about 12 times to say how much he enjoyed the message. We later bought him a bike, just because he had such a impact on my trip. I was just glad to see him again. He grew a little and I almost did not recognize him at first. After service we did the final touches on setting up the computer lab for the church; ran the network cables and got the Internet up and running. The young people include Charles were excited and delayed their going home just to get the chance to see them up and running. Oh I have to get back to the worship. When we were first coming from the airport, I questioned Luke about a analogy that I often use in the story of Jarius daughter. That some people you need to tell them to �get the hell out� the text says and when he put them all out�. the idea is that a lot of people are bringing negativity into your life, and things that come from hell and not from heaven and we need to tell them to get that stuff out our ears so our miracle for our lives is not hindered. Anyway, I wanted to check with him to make sure it was ok to use and he was cool with it as long as I gave the explanation. Ok last year, I stood on his pews, this year I am telling people to get the hell out, I know he is wondering what is going to happen the next time. 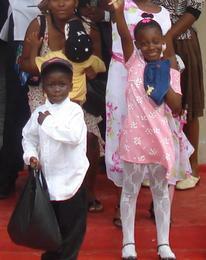 We said our final goodbyes to members of the congregation and headed back to our host families houses. When we arrived they had some raisin ice-cream, I admit this was the first time I ever had raisins in Ice Cream before, it was good, they then brought out some cake, and that famous coffee. Dexter must have drunk a quart. The name of the coffee is Nescafe and I picked up a couple jars today to bring back with me. I headed up to bed and realized that the noise awaits me and I would not get any sleep. I loaded up some pictures, tried to lay down, but could not get a wink as the entire neighborhood was vibrating from the speakers that sat on the roof of the night club. I read some of my homework for seminary. Oh by the way I forgot to tell everyone that I am now enrolled at Lutheran Theological Seminary. The noise subsided about 3:45 AM and I was just left with the dogs and the rooster. I managed to get a couple hours in and then I woke up and walked around the corner to the pastor�s house to answer emails. On the way back there was one dog in my path and I was just praying that he did not come at me. There were 2 other dogs that stood up on the ledge of a property about 9 feet up. They were loose but their owner was near by. I started planning my escape and saw a truck near by. I new if they made a jump I was going to be on top of whoever�s truck that was. The owner closed the gate and it seemed like he had them under control. Oh I have to tell you, last night as we were leaving out. The Thompson�s dog was loose. I saw him on the far corner of the yard and our ride had just arrived. I told Dexter, come on lets make a run for it and shut the gate behind us. Dexter is like a big kid who waits to see if you are going to make it first before he tries it. Anyway we made it bite free. We arrived in Montego Bay, which is 10 miles outside of Cacoon Castle to the hotel. All I wanted was lunch and a hot shower. I felt like I was still dirty even though I took a shower. The thing is that when you take a cold shower, especially when you are used to a hot one, you spend as minimal time in the water as possible. I think I still had dove soap on me from the fly by rinsing. They did not have to worry about me taking my 20 min showers there. I will say that the Thompson Family and the Price Family are the best host families around. They really make you feel welcome and they also love to talk. I am talking about Mrs. Price & Mrs. Thompson. Sis. Thompson�s husband does not say much at all, he just kinds of sits there and sleeps. Their older sister or it may been their mom came in and peeked at him and said �Is he dead.� She was just kidding, he just looked like he was in a comatose state. Around 3:00 we met with O�Neil Brown the pastor of the Cacoon Castle Baptist Church, the church that we have adopted in Jamaica. We have begun the Chosen 300 Food Distribution at his church. I had the chance to learn about the bumps they had the first month. The food got out, but just some administrative things. The first thing was kind of funny. They had put all the food bundles together for the families, and the pastor and one of his deacons were sitting at the church and they were looking at each other with all this food there. The pastor had the understanding the people were picking up the food on Saturday. The deacon thought the pastor was going to drive the food around to the people (which is pretty time consuming, I must say). So anyway you can just imagine two people sitting there looking at each other and having a different plan. It all worked out the food was distributed on Sunday and the people�s needs were met. With this project we duplicated the program we established in Guyana, where we now have 3 churches distributing food to the Guyanees community, and 1 church in Jamaica. With both of these projects the food is distributed out each month and the families sign a form confirming they received the food and those reports come back to us each month. Anyway our first goal for tomorrow is to train the leadership of the program here our expectations in regards to reports and effective distribution. We are not teaching them how to do ministry, we are partnering with them, but we still have requirements that we need to fulfill to insure the funds we are sending abroad are being used for what we intended. It is not that we don�t trust them, it is that even in the business of the church we should not be slowful, but have a clear account of what is being done with the funds our contributors have entrusted us with. We then discussed the service agenda for tomorrow. I will be preaching at the Cacoon Church at 11:00 AM and then doing the food distribution at the Church. I am real excited about this, I should be back to the hotel at 3:00 in which Dexter will be picked up to do the second service at 6:00 in the evening at the Hopewell Baptist Church, and then I will get a little downtime. We leave early on Monday to return to Philadelphia. By the way everyone, pray for Shandai, she is working hard in Philadelphia making sure things are running smoothly. I will talk to you all again tomorrow. I did not have the chance to write yesterday, well lets clarify, I was a little burned out and need to rest a bit. 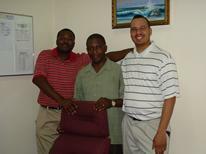 Sunday, morning I was picked up by Pastor Oneil to go to the Cacoon Castle Baptist Church. 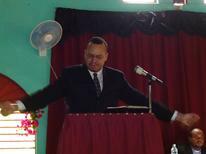 Dexter & I split up the preaching assignments, I took the morning session at Oneil�s smaller church in the Hill, Caccon Castle which is the church we have adopted for the food program, Dexter took the larger one in the evening, Hopewell Baptist Church. Dexter mentioned there was not to many people at the service; only about 10-12 people, the pastor had an outside speaking engagement and maybe his members went with him. Also one of the kids at the church got hurt so some they had to take him to the hospital as well. I kind wish I could have put Dexter in a place that had a bigger attendance since it was his first time on a mission assignment, but I am real proud of Dexter with his attitude towards this. He mentioned that the service was blessed and people who where there received the word with gladness. Dexter has really grown to be a great asset to the ministry. He always was, but his is growing stronger in the faith daily. He has become my Timothy. At the Cacoon Castle Baptist Church, we had about 25 people, this was actually more than I expected. First it was pouring down raining and like Christians in the US, they do not show up when it rains. Well they have more of reasoning behind it. When it rains the roads become very muddy, the hills are on a steep incline, some of them live as far as a mile away and they all pretty much walk to church. Only two people in the congregation have cars. One is the pastor, and one other member. When we arrived he said, �I don�t believe it.� It was 10:50 AM service started at 11:00 and the people were already there. The second obstacle is that there was a funeral on Sunday in the community. I know you are probably saying what does that have to do with it? In this context funerals are a big deal. The �going home� of a love one is a big celebration that last about a week here, and involves a lot of celebration. The main part of the celebration is the night before the funeral, which is sometimes referred to as a �Set Up� or a �Night-Night�. The day of the funeral it is a feast following the funeral. As I stood in line at the airport on the way out, the Jamaican gentleman behind me indicated that the entire community comes to both support the family, but it is also an opportunity to eat. The entire community is welcomed, and no one is turned away to celebrate the going home of a loved one. It can take 2-4 weeks to burry a person depending on how long it takes to raise the money for the burial and the celebrations. Sometimes the celebrations can last for the week. I also found out that the music we sometimes here during the night is not just the clubs, but it is also people celebrating the life of the person that has gone on. It is my perception that with life so challenging, freedom from this life to a reward must be something that is valued more greatly here. Ok I am making my own analysis of this. The Funeral on Sunday was at the Seven Day Adventist Church and they strategically have their funerals on Sunday. It is a good way to bring people who go to other churches into their fold. I guess you can call it good marketing, you would only get that from me. 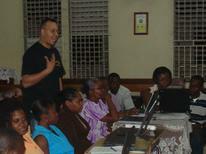 Anyway Pastor Oneil mentioned that this was a great crowd to have 25 people there, and normally he only gets 12. Churches in this context are relatively small. A well established church may have 200 members. The Chosen 300 food program just began last month and already it is having an impact. The word of God really came through on Sunday and a personal thanks to the Holy Spirit, because he had given me so much that I did not even prepare for. 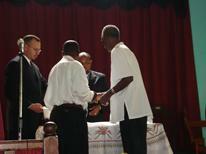 The anointing of God was truly in that place. For those who did not read my last blog. The church is a small one-room church with a tin roof and makeshift lighting. Wires string across the church with sockets. They have been working on expanding and have the structure for the walls, but the construction process for Churches in Jamaica; and really most construction, is very slow. The church only brings in about $30 a month. 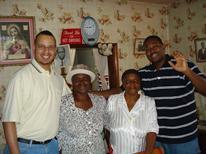 The pastor�s family cannot survive without additional help so they normally rely on their spouses to work. 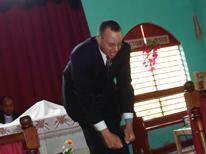 The pastors here also serve anywhere from 2-5 churches as there are a shortage of pastors in Jamaica, particularly in the Jamaica Baptist Union. On the way to the church my eyes continued to swell up with tears and my heart balled up like a rock. Listening to Pastor Oneil about the plight of the people really tugged my heart, and I was mixed with emotions of pain for their struggle, and joy that we have made an impact. There is a program here call food for the poor, but the pastor mentioned the food is not consistent and really the people were never sure if food would show up at the church to help them or not. 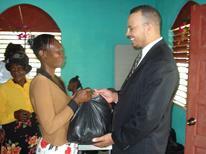 With the Chosen 300 program they can count on that the food would be there every month. You don�t know how good you got it until you see the joy of people when they receive something so insignificant to us but a world of difference to them. A bag of rice, peas, flour, drymilk, and a couple cans of fish really changes the lives of these people. It may only last them about a week or two. 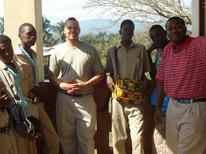 The program is designed not to develop dependency, but to establish hope. 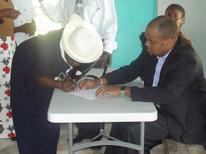 And through the food program and the evangelistic effort hope is being restored to a people. 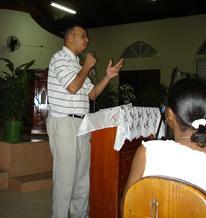 The pastor also talked about the needs of his congregation. One is a van for the church. He had a good idea to get a van and have a congregant use it during the week as a taxi service to cover the note and the insurance. During the weekend they could use it for church. He also wanted to do a computer lab as well. We can work on this for a return trip in the future. As I entered the church in the rain, normally I would duck for cover, but it did not seem to be that important to me that I was getting wet. I remember sitting in the pulpit looking down at my shoes filled with mud spots. If I was in any church in the US, I would probably have a complex about this, but none of these things seemed to matter. The church opened up with a song. �As long as you cover my soul everything will be alright.� It amazes me that in the US we need so much more for things to be �Alright,� but here the mere fact that God covers their soul, is sufficient and everything else is a blessing or an added bonus from God. I mentioned before in my Guyana Journal that people in developing countries or in impoverished states really have taught me what true worship is about. During the worship we served communion. There was no fancy communion wear, not silver or brass communion plates, but an old wooden cup holder with slots for each of the communion glasses. For the bread and it was just that, bread that had been cut up in small squares sitting on a plate that we would use in our kitchen. But the simplicity of the communion seemed to me to add more value. The Cross was not a pretty place nor was in convenient; it was a place of simplicity and a place of death for our savior. After the worship we had the food distribution, Pastor Oneil sat at the table signing in people to get the food while I had the chance to past each family representative a bag of food for the month. The people were so grateful and I think I smiled more than they did knowing that Chosen 300 was making a real difference. I love preaching, sharing the gospel, but I believe that God has put a special anointing on my life to feed people. I remember several years ago, one of my board members Scott Rankin was down on the Benjamin Franklin Parkway serving the homeless with me. On one particular night we had an abundant amount of people and we ran out of food that night, which is a very rare occasion. Out of the blue, a college group from out of town showed up and said we have food, can you use it. They said they come down about once a year to do a outreach and they just happened to show up on the day we were serving with food, when we ran out. Scott said something so profound that night I can never forget. He said, �I actually get it now, God wants these people to be fed.� It has nothing to do with our judgments of why they are there, what they have or have not done, God wants us to feed them and empower them to get up. I left the church that day filled with joy. We headed back to the hotel and Dexter left out about 5:00pm for the second service. We are now at the airport waiting for our flight to Philadelphia. The lines are extra long today. There is a strike with the airport workers who work under a Union Contract for BTIU the current union. According to one of the strikers, the employees are very under paid. They are only making about $500 US per month and many do not have benefits. The current union has been under control of much of the airport work for the last 30 years. The workers want to get out of the contract and go with the new union in hopes for a fair wage and benefits. I pray for them, I can not imagine trying to live off of $500 a month. I know a lot of people do, and some a lot less. But for skilled labor and people who are working for the airport, it is sure to be unfair. Especially, with the amount of money this airport generates. If you could just see the amount of fees that were attached to my ticket. When our plane came in, the people who were checking in the passengers, asked the flight crew, "so who�s going to load up the luggage." I heard the flight crew actually had to go down and load the bags. It was a mess and plus our flight was about 4 hours late. We are about to board, but I want to thank you all for your support and traveling with me on this Journey. May the grace of God and the sweet communion of the holy spirit rest and abide with you all, now henceforth and forever more.